Santat, D. (2014). The Adventures of Beekle: The Unimaginary Friend. New York, NY: Little, Brown, and Company. Genre: Picture book, imagination stories, and Caldecott winner. I have no objections to this at all. Book Summary: An imaginary creature is born on a magical island and waits to be chosen as a friend, imagining all the fun things that they will do. When that doesn’t happen, he sets off to find his friend, ending up in the top of a tree. He waits until his friend comes along and gives him his name: Beekle. They then proceed to have a number of wonderful adventures together. Impressions: (Full disclosure: I met Dan last fall, when he was out for school visits for After the Fall, and he was one of the most fun and delightful people I’ve met. That has probably influenced my view of this book.) 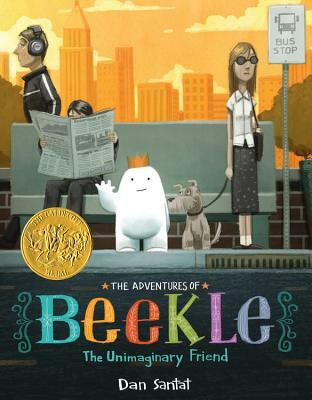 I thought The Adventures of Beekle was a sweet story, one that had a right amount of challenge — Beekle being determined to find his friend — suspense — will he find his friend? — and a very cute, hopeful resolution. 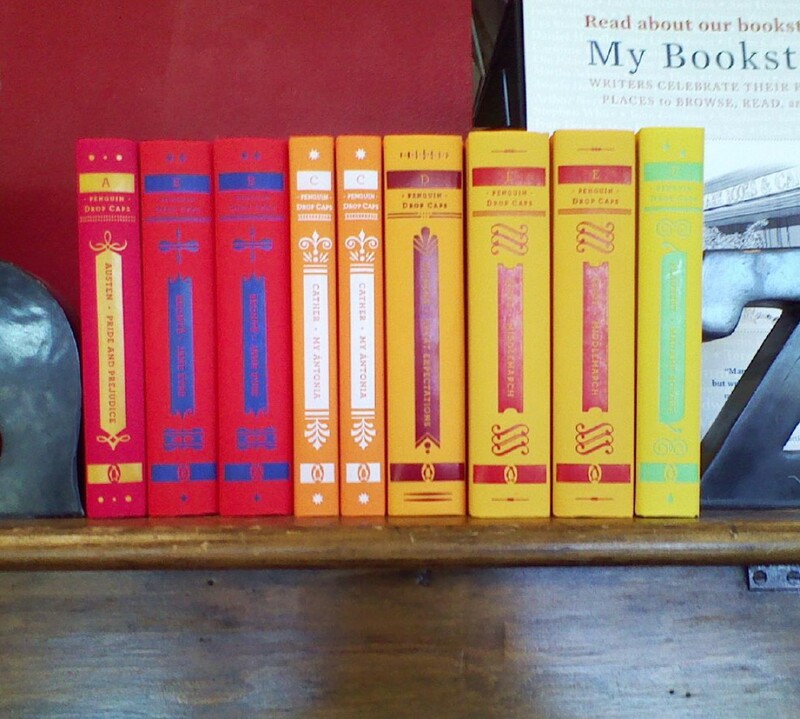 I really liked the whole package as well, from the endpapers with everyone’s different imaginary friend, to the range of colors that Santat uses throughout the book. It’s telling that the magical world is in bright colors, but the real world in more muted grays and blues (until he gets the playground, of course; adults are boring!). It’s also very poignant that the world become brighter and more colorful after Beekle finds his friend. I know that Santat is a digital artist, and it amazes me that he drew everything on a tablet and colored it in digitally; it not only shows how far technology has come, but how talented he is to be able to get the range he does. It truly is a delightful book. Review: The School Library Journal gave The Adventures of Beekle a starred review, writing, “Santat’s attention to detail in the mixed-media illustrations shares a child’s eye for laughter and movement on full-bleed spreads with strategically placed text.” Interestingly enough, while Publisher’s Weekly gave it a glowing review, they felt that the third-person narrative, with no dialogue, slowed the book down. School Library Journal (SLJ). (2015, February 2). SLJ reviews of 2015 youth media award-winning publications. Retrieved from: http://www.slj.com/2015/02/industry-news/slj-reviews-of-2015-youth-media-award-winning-and-honor-books/#_. Library Uses: This one is perfect for a storytime on friendship, imagination, or even one featuring Caldecott winners. We Forgot Brock by Carter Goodrich: Another imaginary friend story, though in this one, the imaginary friend gets left at the fair and it’s up to the boy to rescue his friend. Another delightful story of friendship, even if other people can’t see them. My Friend is Sad by Mo Willems: In which Piggie sees that Gerald is sad, and because Piggie is such a good friend, tries to cheer him up, with no success. It turns out that’s because Gerald wants to share the exciting things with his best friend, Piggie. With a sly sense of humor — kids love being more in the know than Gerald — this teaches that 1) it’s okay to be sad sometimes and 2) we all need friends. Not a Stick by Antoinette Portis: A simple story illustrating all the fun things a simple stick can be when you use a little imagination.There is a lot to discuss, as each picture illustrates something different, while the text is pretty plain. Great for inspiring imagination, though.